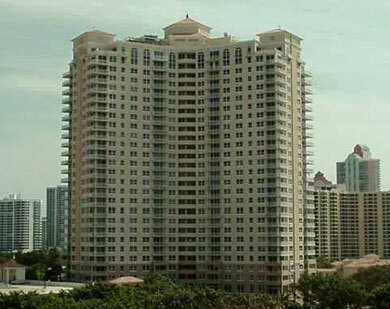 Turnberry Isle's Turnberry on the Green is a 27 story Aventura condominium found on the southwestern side of the isle and comprised of 377 units that perfectly complement the profuse amount of activities and sights found throughout the sprawling island community. The Turnberry on the Green condo living experience includes amenities like a gourmet market, billiards, a barbecue area, a lagoon style swimming pool, aerobics and yoga plus much more. The Aventura condos for sale of Turnberry on the Green are available in five different floor plans named after famous golf destinations and have one, two or three bedrooms. These floor plans are called Agusta, Highland, Oakmont, St. Andrew and Spyglass. Turnberry on the Green's location provides numerous places to explore nearby. Spend an afternoon shopping at Aventura Mall or see the latest Hollywood blockbuster in the mall's IMAX theater. Explore the beaches found within the cities of Hallandale Beach and Sunny Isles Beach or visit the barrier island of Miami Beach and get to know hotspots like Lincoln Road and Ocean Drive.